Good Saturday morning! Today is an exciting day---this evening I'll be taking part in a public investigation at the Trans-Allegheny Lunatic Asylum in Weston, West Virginia! I've been to the pre-Civil War era hospital several times and taken several historic tours, but this will be the first time actually investigating the iconic haunt. And, since there has already been SO MUCH written about the hauntings (much of which I will include in a post-investigation wrap-up blog) I thought it would be interesting to take a slightly different look for today's blog. If you follow Theresa's Haunted History of the Tri-State's Facebook page, chances are you've seen this photo before. One evening last February, I was on the WV History on View site and found this photo. I saw the Trans-Allegheny Lunatic Asylum in the background, which piqued my interest, but then I saw what was happening in the photo. 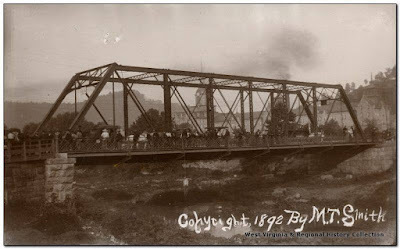 This photo was taken in July of 1892 by M.T. Smith who later sold the prints for 35 cents a piece. The image is that of the July 6th lynching of Edgar Jones, a 22 year old African-American who was accused of stabbing to death 25 year old Michael Tierney in the kitchen of the Commercial Hotel. The bridge is the West Second Street Bridge. We, especially those of us in the paranormal community, tend to think about all the tragedy that occurred at Trans-Allegheny itself---it never crossed my mind that something else so traumatic happened right there in plain view of the hospital. Sometimes history can be ugly---real ugly---but if we ignore it, then we ignore the memory of those involved.